For every time in our lives, there is an opportunity for reflection and celebration. 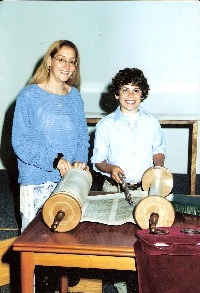 "We wanted to thank you again for making our son's bar mitzvah such a wonderful experience. I can't tell you how happy we were with everything. You are such a warm caring person and that really came out during the service. You are just a wonderful rabbi, a true asset to rabbi-hood." "We just wanted to say it was a pleasure for us as well, you really made the ceremony beautiful with your kind words. everyone was raving about how perfect the ceremony was and how it was the best one they had ever been to, so we have you to thank for helping us make that expierience for everyone. So yes it was a great celebration ...thank you for everything." From a guest at a wedding: "Your service yesterday touched me deeply. Your grasp of universal concepts of love and peace shown through your words. What a perfect wedding ceremony. I have attended many weddings in my life and [this]ceremony is the one I will always remember." "We just wanted to thank you for marrying us. The service was just beautiful and more than we ever expected. Not only were we stunned at how gorgeous the wedding was, so were our guests. God has really given you a gift and we are so glad you could share it with us. Your words moved everyone and made a difference in many lives."